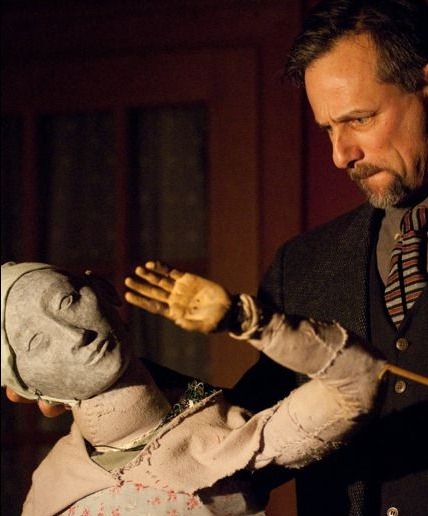 Michael Montenegro has long held a singular place as Chicago’s master puppeteer. 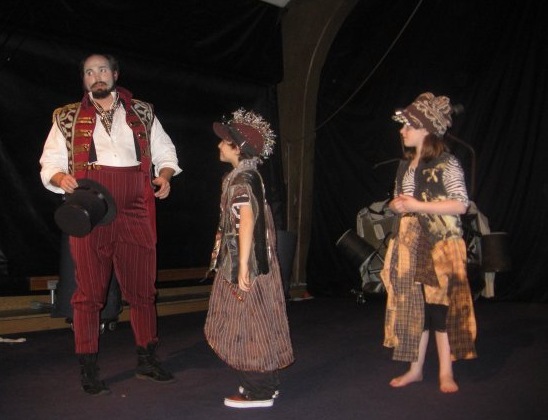 With Solo Works at Theatre Zarko in Evanston, he returns to his roots —a set of simple performances that recall his early days performing for children at the Lincoln Park Zoo. 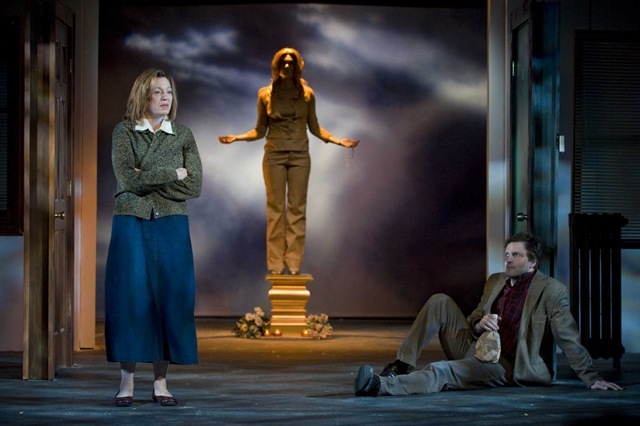 Most of Chicago’s theater community remembers him through his haunting, ethereal contributions to Mary Zimmerman’s Argonautica in 2006 or Writers’ Theatre production The Puppetmaster of Lodz in 2007. Plus, critical accolades have heightened attention to his brainchild Theatre Zarko, with Klown Kantos/The Sublime Beauty of Hands in 2009 and Haff the Man/Falling Girl (our review ★★★★), which we named as one of the top 25 shows of 2010. Montenegro eschews the limelight, but, more often than not, his ever-changing artistry draws a small but extremely devoted following. Solo Works displays the craftsman alone with his puppets—a modest presentation pared down to the most basic elements of light and darkness, spare proscenium, and one musician, long-time collaborator Jude Mathews, at a low lit keyboard, providing most of the production’s carnival atmosphere. As such, each short theatrical piece forms a fragment or a mediation on the puppeteer’s life. “Myself at Ten” starkly sets a black and white photo of Montenegro at 10 years old atop his darkly dressed adult body, with a simple four-legged puppet that he manipulates to run, walk, stretch and leap. It wordlessly explores a boy’s budding discovery of the ability to animate inanimate objects–filled with enigmatic wonder and not a little hint of control. But the question of who controls whom pops up again and again. “Sing” cunningly portrays a man coming home to disrobe and unveil his latest purchase, a bird in a birdcage that he exhorts to sing. But nothing can be exacted from bird without a little performance from the man first. Likewise, both “A Man with A Bag” and “A Short Lecture” reveal the ever-present danger of puppets taking control, once they assume a life of their own. 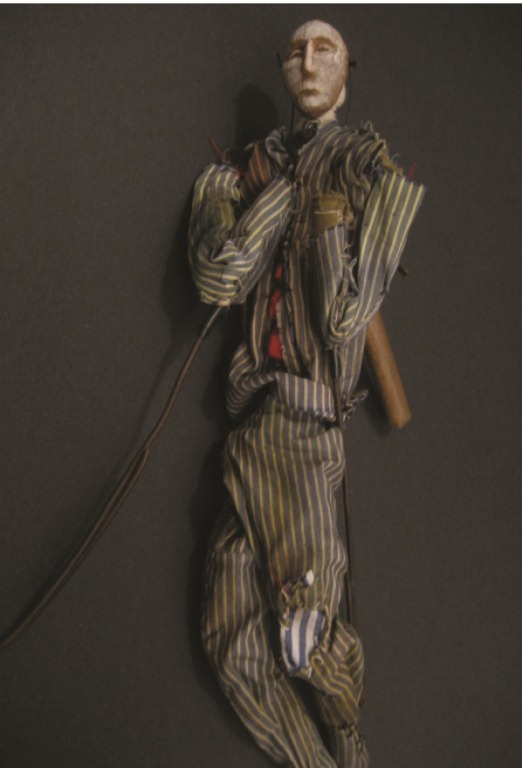 Even “Gustavo” depicts a puppet violinist being dictated to by his own violin, which opens its toothy mouth and makes demands like, “I want to go to Hawaii,” or “I want to be a cello.” Time and again, Montenegro’s creations make Id-like pronouncements that inform, critique or disrupt the puppeteer’s course of action. It’s a testament to Montenegro’s skill that he can transform his bare hand into a puppet with a menacing presence. But more to the point, the puppeteer must respond to what he has vivified. By far, the evening’s boldest, most enigmatic and existential work may be “Giacco,” wherein a grotesque, almost ghostly head is manipulated to speak, urging another puppet, formed only by Montenegro’s back, to run toward the crowd. But Solo Works mixes intricate, esoteric puppetry with elements of crowd-pleasing, Punch-and-Judy street puppetry. Childlike rudeness and joy blends with the graceful, the magical and the profound. What is more, Theatre Zarko always produces work in constant evolution through the course of the run–the show an audience sees one night may not be the same the next. At times, the fragmentary nature of Solo Works frustrates because it lacks a strong cohesive arc. 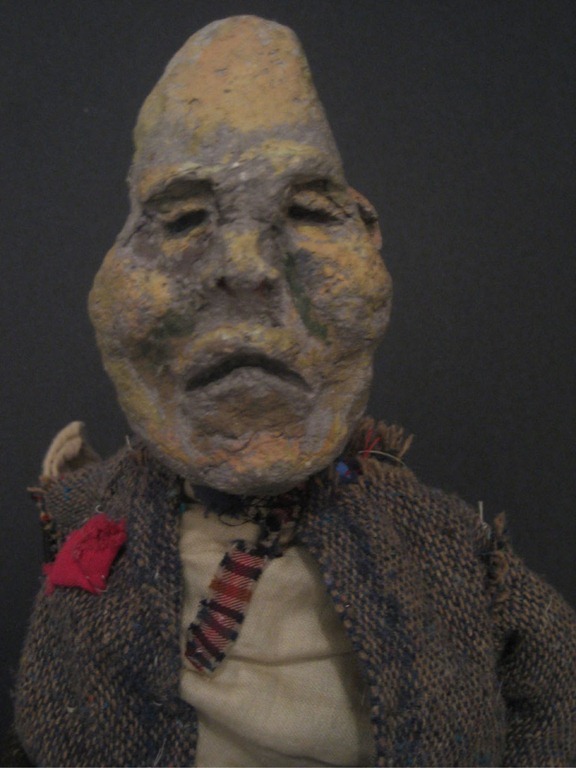 But that will not prevent anyone from becoming absorbed, moment-by-moment, by the master’s dreamlike figures sculpted from wood, wire and cloth. The figures may reflect a life made up of pieces and bits–found, repurposed, and re-awakened. There’s something rather “Mad Max” about Lost and Found: a Recycled Circus. 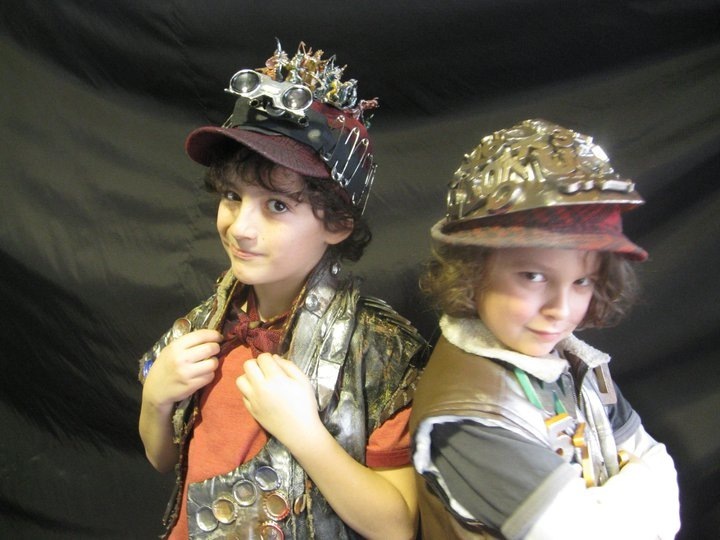 Its child performers are costumed in ragged, industrial odds and ends, recalling Tina Turner and the Thunderdome more than an Actors Gymnasium production at the Noyes Cultural Arts Center. Not that there’s anything wrong with that. An apocalyptic circus at the end of the world suits, with its the rag-tag cast carrying on with life’s basic concerns and recreating new wonder out of the old and nearly forgotten. Under the direction of Larry DiStasi, a circus tradition is handed down to younger generations—a little worn and hodge-podge, but no less exciting for all that. Andrew Adams, Zoe Boyer, Will Howard, Matt Roben, Meredith “Tommy” Tomlins and Lindsey Noel Whiting make up the adult members of the cast, stumbling clownishly through their own dilemmas of losing and finding love. Matt Roben, in baggy clown pants, timidly and haltingly pursues Lindsey Noel Whiting who, prior to the start of the show, tries to sell concessions that include uncooked parsnips and cans of spam. Roben, who has enough on his hands with mischievous kids cramping his dating game, has a rival in the hilariously portly Will Howard, who gives Whiting a date she’ll never forget—for all the wrong reasons. Lost and Found is brilliant in bits and moments. Some of these inspire with Dada-esque disjointedness, as when Hannah Schwimmer sings “Poor Wandering One” with the introduction of Howard. But the integration of Actors Gymnasium Teen Ensemble into the storyline between Roben, Whiting and Howard seems to almost be an afterthought. Their numbers create a brilliant visual impact during a choreographed juggling sequence with Adams and their drumming with the younger cast members boosts the excitement of the show. But for a high-concept sort of circus, it’s curious that their acrobatic work is not integrated with the rest of the story. DiStasi tacks their turn at the teeterboard at the end—and as an encore to the production. Still, it’s an encore that produces a burst of energy and that’s the most beautiful thing about Lost and Found. On these final chilly and rainy days of winter, this production will charm, warm and wow you. 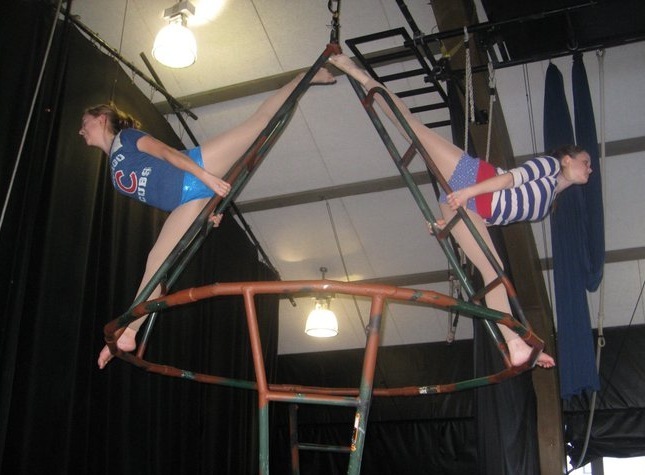 Lost and Found: A Recycled Circus, featuring aerial acrobatics, live music, and magical, found-object invention, continues through March 13th at the Noyes Cultural Center. Performance schedule: Fridays 7:30pm, Saturdays 4:30 and 7:30pm, Sundays 3:00pm. Now in an absorbing but ultimately frustrating Midwest premiere, J.T. 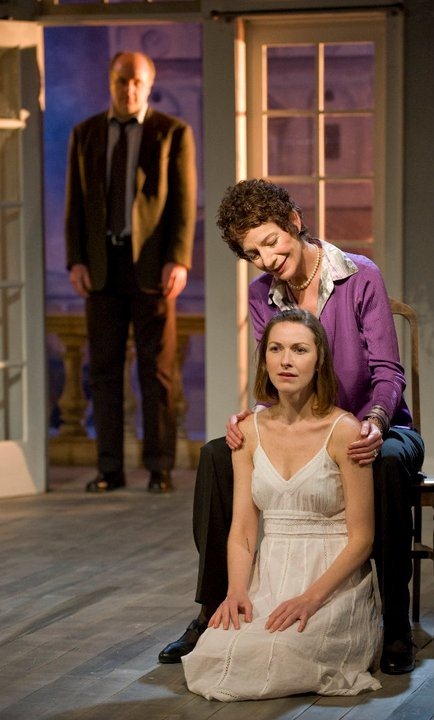 Rogers’ 2004 puzzle play employs three characters who deliver concurrent confessions in the same stripped-down hotel room overlooking the Spanish Steps in Rome. They speak from different times and the subject of their unmotivated outpourings gradually becomes the strange vanishing of Gideon. A scion of wealth and privilege, this attractive young man went to Madagascar on a mission that may have ended in disappearance or death. 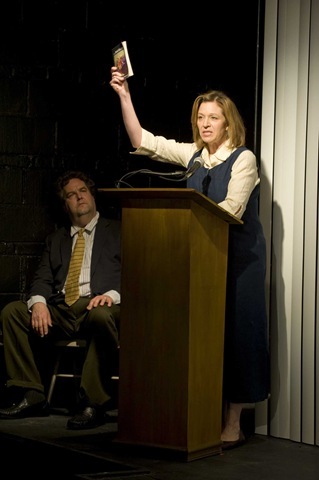 The testimony is supplied by Lilllian (Carmen Roman), Gideon’s wealthy and detached mother; Gideon’s sister June (Cora Vander Broek), now working as a tour guide for the ancient ruins, and Lillian’s adulterous lover Nathan (Mark Weber), who is also an economist like the boy’s now-dead dad. As they give themselves away, they provide clues about Gideon, an enigmatic beauty who seems to have been altogether too sensitive to the world’s wrongs; especially his mother’s coldness to him and warmth to Nathan. Gideon’s discovery that his life was built on a lie (about his mother’s fidelity, his sister’s affection, Nathan’s loyalty to his father, or some schoolgirls recently raped in Africa?) seems to unhinge him and sets in motion a train of tragedies. Why is he so upset? “Because people just can’t be trusted!” and his mother is “selfish” and “grotesque.” Gideon sounds like a poor man’s Hamlet. 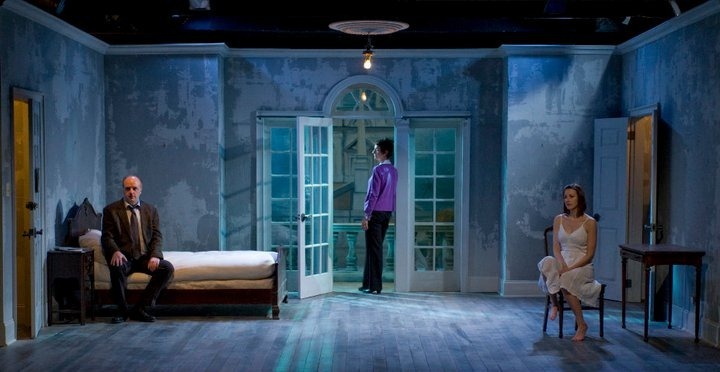 Sean Mallary’s lighting changes and the choreographed confessions blocked in Kimberly Senior’s staging keep the clue-mongering fluid and forceful. 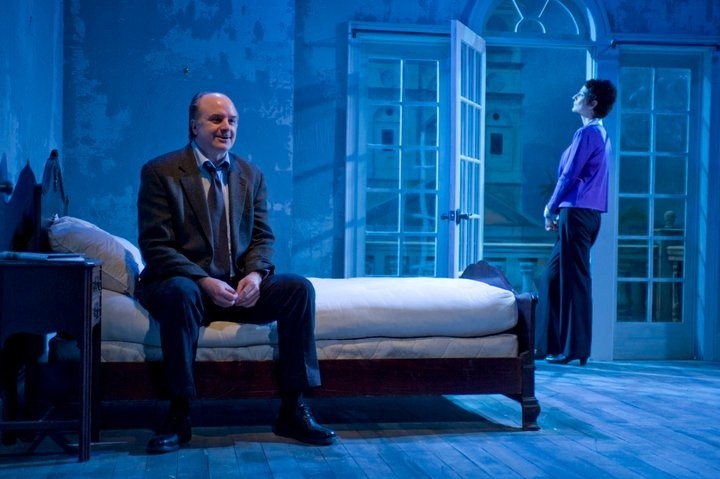 The play repeatedly raises the fascinating question of why some driven people all but will themselves to be missing persons. Do we have the right to disappear? Or do we owe it to others to keep our identity intact, however wrong it feels within? Still, there’s too much deliberate or perverse mystery-mangling in this torturous witness to an escape that remains maddeningly evasive. There are too many blanks for the audience to fill in without finally feeling that the playwright hasn’t played fair with the facts. Roman brings magisterial command to this ultimately devastated mother. Vander Broek’s questing sister, Gideon’s fraternal twin, gives us a refracted portrait of her brother. Weber’s Nathan supplies metaphors from micro-economics that shed a little light on the motivations or mentality of the missing Gideon. If only this complex kid had appeared, we’d get some closure or at least an illusion of completion. But if you like to spend two hours not solving a missing person’s case, Madagascar is your ticket to nowhere. “What’s so wonderful about honesty? Mama said, ‘don’t be 100% honest.’” A retired widow shares her cookies and recollections. 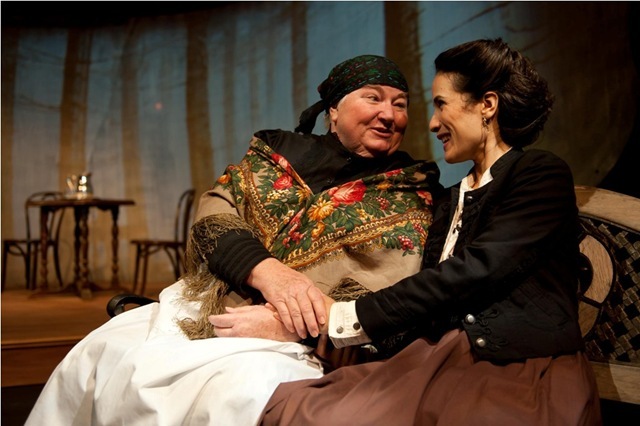 Next Theatre presents the Midwest premiere of The Piano Teacher. Mrs. K self-identifies as being effortlessly good at many small things. Musically inclined but not quite the concert pianist, Mrs. K starts out as a piano tuner. Later, she teaches piano from her home. Over the course of thirty years, she instructs hundreds of children. 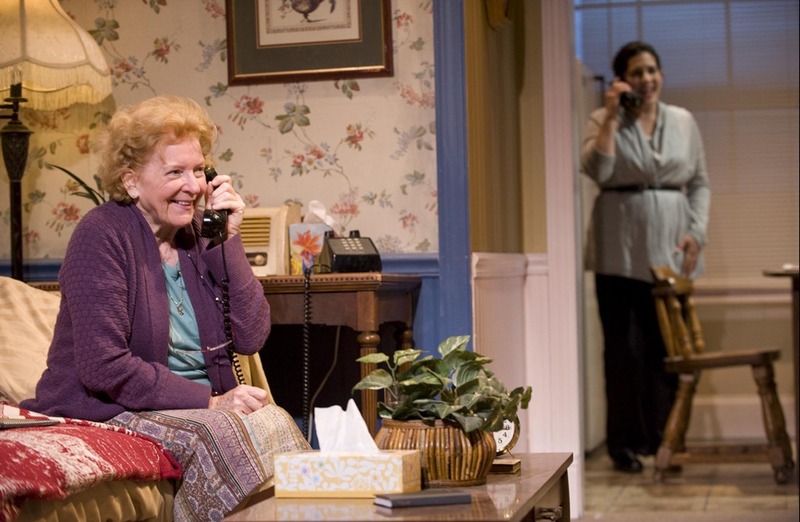 Out of loneliness, Mrs. K starts calling up her former pupils to reminisce. The reconnection jars memories that she forgot she had wanted to forget. While she was practicing scales in the living room, Mr. K was providing life lessons in the kitchen. The musical appreciation class was overshadowed by Genocide 101. The K homeschooling did have a profound impact on its students. It just wasn’t the recital variety. The Piano Teacher dramatizes the long lasting effects of being traumatized as a child. 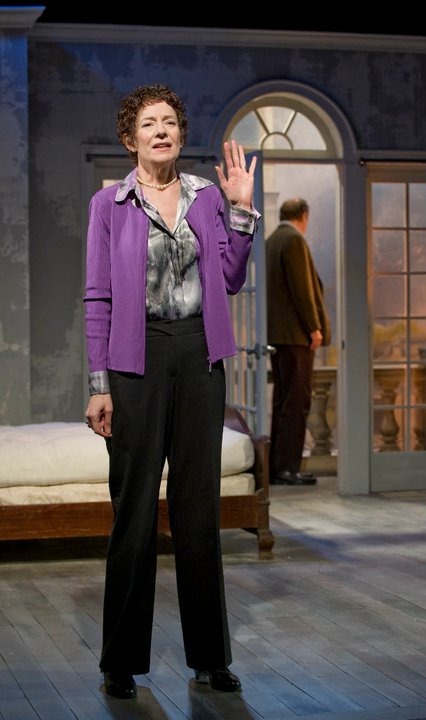 “My husband always said I expected too much… people are just being who they are.” Mary Ann Thebus (Mrs. K) hits all the right notes as the piano teacher. 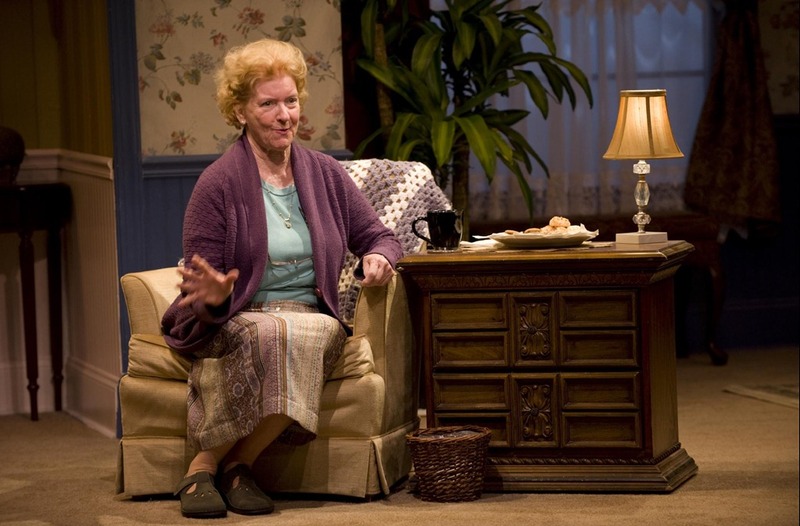 Under the direction of Lisa Portes, Thebus delivers Julia Cho’s monologues with all the familiar charm of the grandmother-next-door. Thebus is outstanding as she directly addresses the audience in the narration of her story, engaging with humorous reflections on the simple pleasures of cookies and “Dances with the Stars” enjoyed over a cup of tea. Shaking her head in amusement and continually nibbling on cookies, we see the authenticity of Thebus as a sweet old lady trying to piece together her life. 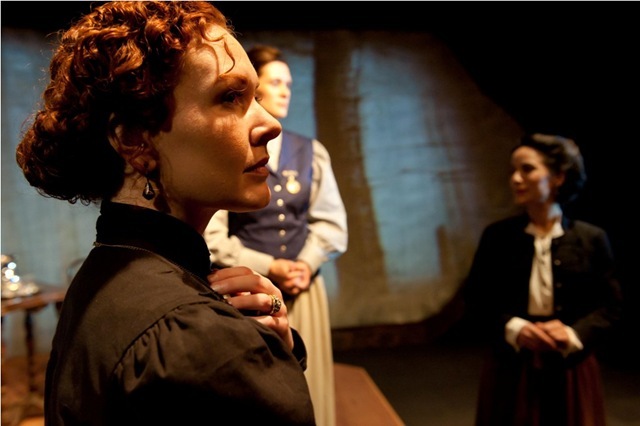 This visual becomes haunting as Mrs. K is confronted with the past. Manny Buckley (Michael) gives a darkly crazed but controlled performance as a prodigy child turned disturbed adult. Buckley’s forceful interaction makes for a heart-wrenching contrast to Thebus’ fearful denial. Buckley’s wild eyes are especially threatening even when he speaks with eloquent normalcy. Representing another side to the same story, Sadieh Rifai (Mary) brings an empathetic balance as a grateful student that is worried about her favorite teacher. The past meets present on a set, designed by Keith Pitts, that captures perfectly a piano teacher’s living room complete with musical artwork. The visual adds to the storytelling with a layer of cozy familiarity. It’s this preconception that makes the revelations more stimulating. Playwright Julia Cho introduces character analogies that are beautifully sad ‘He looked thirsty and he looked at me like I was rain.’ The narrations are delivered in fragment ramblings by a nice old lady, but when the puzzle pieces are placed together, it’s not the picture perfect image of a piano teacher’s home. Cho tells a thought-provoking tale of children’s loss of innocence. Combined with the homey atmosphere and the talented cast, The Piano Teacher is a genuine lesson in facing the music. SPOILER ALERT: The front row gets cookies. Plan accordingly. 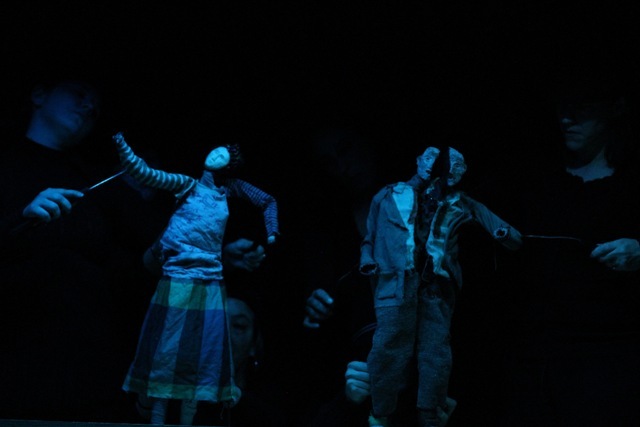 Theatre Zarko does something far more profound than ably tell stark, simple tales with charming puppets. 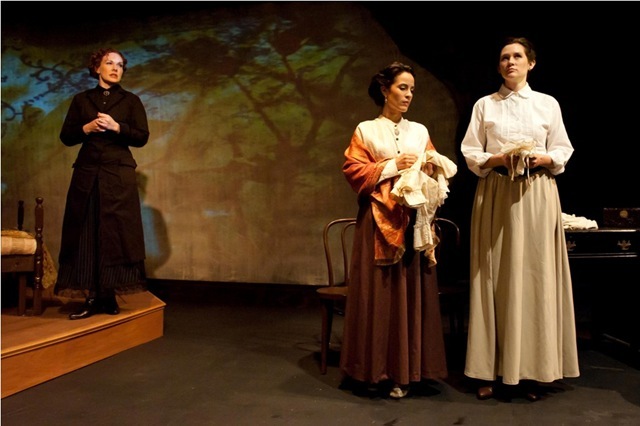 They revive the very meaning and value of Symbolist Theater for Chicagoland audiences. 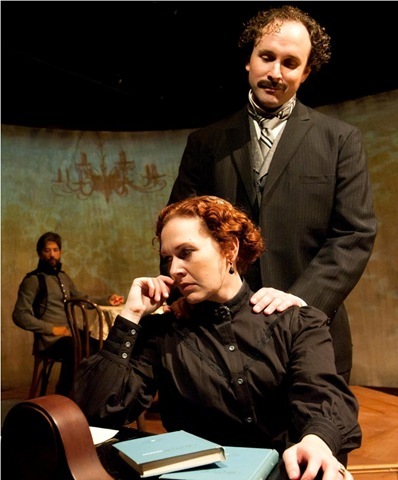 Artistic Director Michael Montenegro has a vision—and that vision is to mount productions that reawaken the Symbolist mission of creating drama as poetry, not just re-do Symbolism as a period movement, creaky with inbred art house nostalgia. He and his ensemble of performers succeeded last season with The Sublime Beauty of Hands and Klown Kantos. They win once again with Haff, the Man and Falling Girl at the Noyes Cultural Arts Center in Evanston. In fact, the show provides the best of both worlds. It contains all the immediacy and risk of live theater, while integrating light (Scott Lee Heckman), music (Jude Mathews), sound, projections (Ellen O’Keefe) and movement to almost pristinely pure cinematic effect. Even the performers’ stately movements – setting up between scenes – take on a ritualistic element within the overall performance, replicating the economy of modern poetry. Nothing is wasted. 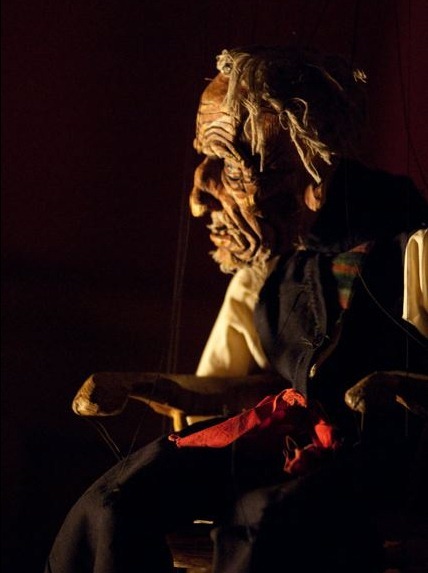 Every word, every sound, every puppet’s shaky gesture or turn of the head generates deep and lasting poetic impact. 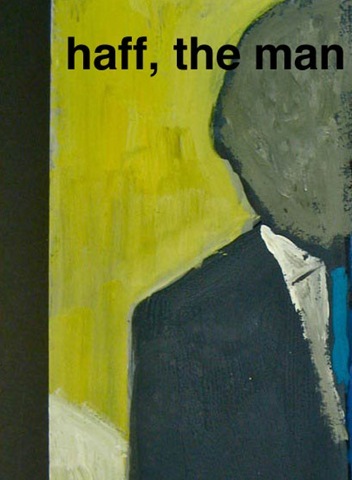 Haff, the Man generates tension and suspense through the two warring halves, literally, of one desolate man, Lou. The left half of Lou retreats reclusively and bitterly at home. The arrival of his right half is an unwelcome visit, as if from a dangerous stranger or an enemy with which he’s achieved an uneasy détente. But the right half of Lou has met a young woman and wants to take the rest of him forward into a new and promising future. Lou’s woundedness recalls left brain/right brain theory and the puppeteers are masters at suggesting mood, as much as the orchestra sets up perfect atmospherics with singing bowls and African djembes. Is she delusional? Is her jump really a cry for help? Or is it a daring act beyond the comprehension of the people who witness it? Her witnesses are many–jaded party-goers who think that young women throwing themselves off of buildings are “an interesting diversion for the tenants.” Others urge her, as if to stop her in mid-fall, “You still have time to rush around and be busy.” A line of identical secretaries begs her to take them with her. 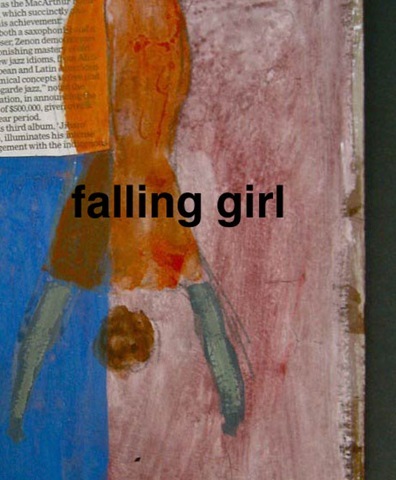 What’s more, Falling Girl’s fall seems interminable, suspending her and all who watch her in a dreamlike state. 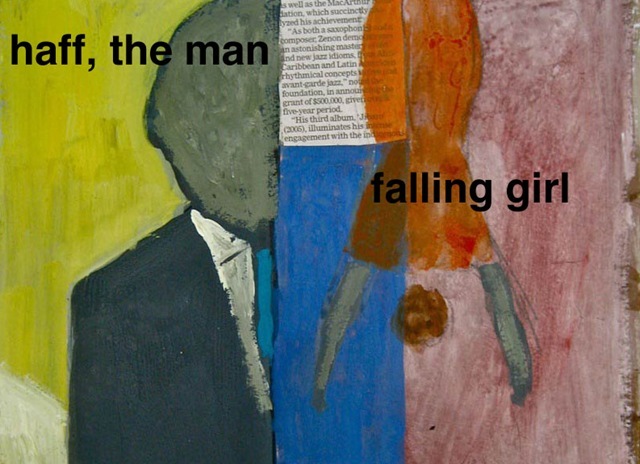 Falling Girl and Haff, the Man are the stuff of dreams. Theatre Zarko’s interplay of light and dark with each story evokes the silver screen. At the same time, their production is homey, earthy and intimate. They have achieved both epic and minimalist theater; they have found the macrocosm in the microcosm. Show runs October 8 thru November 21 at Noyes Cultural Arts Center. (Friday and Saturday at 7pm & 9pm; Sundays at 3pm). Note: This production is not recommended for children.